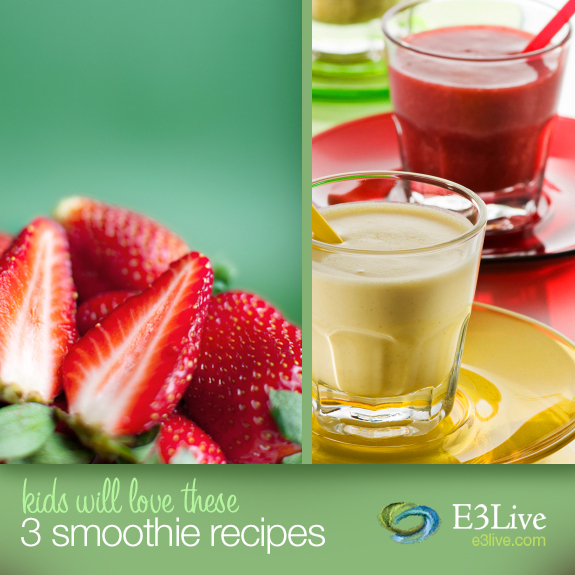 Three E3Live Smoothies Kids Will Love! We get many clients asking about recipes for E3Live – especially for E3Live juices and smoothies – and we are happy to give you three of our favorites today! If you are new to E3Live (or to green superfoods in general) you may not yet be used to the fresh, very green taste. Don’t worry! Often clients tell us that after taking E3Live for a week or more, their taste buds change and they not only like the taste, but crave greens in general (veggies and the like too) when they did not before. Amazing! You may also be a parent trying to “hide” nutrition in your kids’ food where you can – and we find that many kids will eat E3Live right off a spoon if presented in a fun way. If that doesn’t jive with your young one, you may want to try working the E3Live into a delicious fresh fruit smoothie – the taste is usually totally hidden and the fresh fruit taste that kids love is what comes through. Try these three personal favorites from our staff and E3Live kids – and also feel free to write other recipes that worked for your family below in the comments – we would love to hear about them, enjoy! Note: of course you know your child best, so please substitute or omit ingredients as you see fit – these recipes are pretty adaptable, substitutions should be easy to make. Put all ingredients into a blender and blend on high-speed for 30 seconds or until smooth. Pour into glasses, garnish with mint leaves and serve. optional: a pinch of cardamom adds a nice touch. Have fun with these and let us know if they were a hit with your family! ← Welcome to our E3Live Blog!